Looking back on another successful fiscal year, the campus community is honoring the generosity of alumni, parents, and friends. Overall giving to Colgate rose nearly 10 percent to $35.1 million between July 1, 2017, and June 30, 2018. During that time, more than 13,300 alumni made a gift to the university, and the Colgate Fund received $7.8 million — a new university record. Total annual gifts for Fiscal Year 2018 reached $13.5 million. 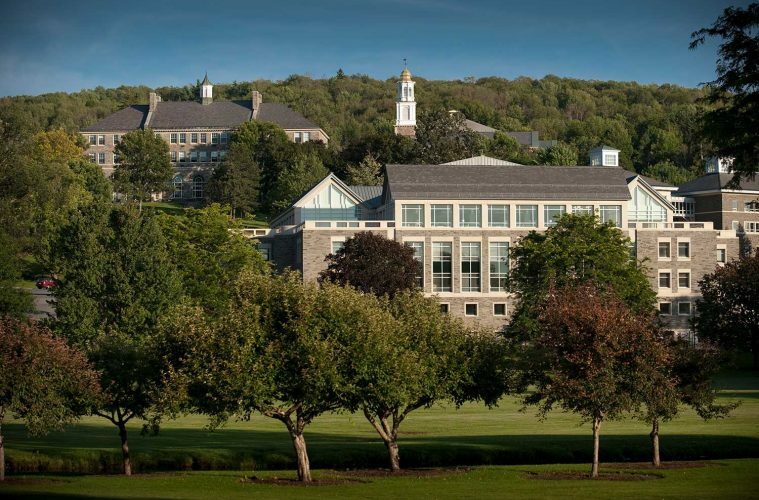 The Colgate Fund allows the university to address its greatest needs and opportunities each year. Nationwide, unrestricted giving has declined significantly in both dollars and participation rates since Fiscal Year 2015. At Colgate, unrestricted giving totals have risen 30 percent while participation has increased from 40 percent to 46 percent in that same time period. “This feat is a testament to the loyalty of individual members of our community, from all class years and all economic backgrounds,” said Interim Vice President for Institutional Advancement Douglas E. Chiarello ’98. Gifts from the Presidents’ Club accounted for more than $31 million of the university’s fundraising total. Along the way, Presidents’ Club membership rose to a record 4,500 and included more than 1,000 students. Parents and grandparents gave nearly $4 million — $373,000 of which came during a single giving day on April 13. More than $3.5 million was directed to the departments of chemistry and philosophy, the Center for Freedom and Western Civilization, and general faculty development. Financial aid garnered $7.51 million, exceeding goals by more than $500,000. Athletics extended its 2018 winning streak by raising more than $2.3 million, one of its strongest totals on record. Planned gifts generated $12.2 million, 36 percent ahead of FY2017. Support poured in for campus expansion and beautification projects: $630,000 toward two new residence halls that are currently under construction on the upper quadrangle and nearly $200,000 toward Bicentennial tree planting, which attempts to restore the university’s canopy to its historic grandeur while reducing Colgate’s carbon footprint. All of these numbers translate into real impact for Colgate students. Facts and figures become academic programs, research projects, off-campus study, Division-I athletics, artistic expressions, and more.